At 10:26am, beneath a blanket of grey clouds, Steve, Israfeel and Cam had a conversation at the centre of SG Findorff’s immaculate new wicket. The topic: to bat or not to bat. It was all rather Shakespearean really, and quite fitting that it would be the nobler mind of Steve “Drama” Aplin to make the bold declaration that came true through the course of the match. Israfeel wanted to bat. Drama said we should bowl, because he believed the slings and arrows of outrageous Israfeel would rip through Findorff. Cam (and we’ll refrain from calling him Camlet) was unsure, but in the end didn’t have to decide, as fate handed Findorff the toss and they chose to bat. Israfeel ripped through them, taking 6/36. That was looking far from likely after he went for ten in his first over. Opener Hamid, the league’s top batsman through four games, was looking organised and confident, right up until Israfeel knocked over his leg stump in the game’s third over. With Israfeel in the groove and Kamal bowling his miserly line, Findorff were suddenly on the back foot. THCC had the momentum and wouldn’t let it go. The bowling, including Aman’s very tight nine overs, was brilliantly supported in the field. Raman was particularly impressive at short leg, instigating a remarkable run-out with Steve and also taking a sharp catch. Dom also took a good catch at short cover while Cam nabbed two lollipops at mid-off. But more, it was the pressure fielding, stopping fast balls and chasing hard in the field, that made runs seem so hard to get. Wickets continued to fall at regular intervals. Ammar showed some capability, hitting a six just about into Lower Saxony, but even he didn’t last long. Only Findorff captain Rashad showed any resistance, batting sensibly for almost an hour to finish 15 not-out and give his team something to bowl at. 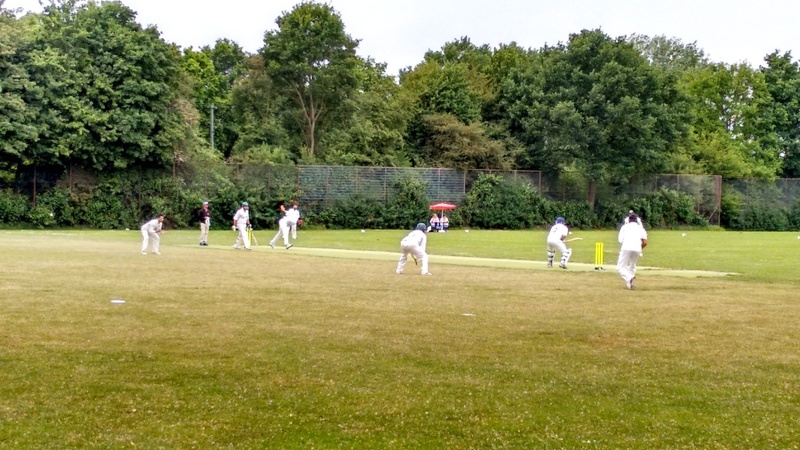 Chasing 105 may not seem much of a task, but Findorff are a strong bowling team and the ball was moving all over the place in the damp conditions. Importantly, Cam and Dom made a solid start, pushing the score to 32 before Cam was bowled by a good ball from Iftikhar, with the same happening to Guru in Iftikhar’s following over. With Rashad suffering from cramp, it was left to Hamid (also the league’s leading bowler) and Iftikhar to pound away, with both generating movement and pace. When Dom was caught, the score was 3/62 and there was more than a bit of nervous tension in the air. That nervousness may go some way towards explaining the somewhat excessive appealing (which included fielders marching towards the batsmen a few times, something that’s not the best thing to see in cricket). But Findorff are a good team and they were pressing hard, understandably desperate for the wickets that would win them the match. They were aided by good bowling and some interesting interpretations of the LBW rule, but were slightly undone by poor fielding and a wide count that amounted to over a quarter of the required 106 runs. As a few more wickets fell, runs were becoming hard to get. It took some smart batting from Jatin and Nabeel to get THCC over the line, winners by four wickets. The exclamation point on the day was Israfeel’s bowling, but this was without a doubt a team victory, and one made all the more satisfying given the absence of key players Sandeep, Bipin and Trived, and that Findorff were undefeated coming into this match. So, this time, it was a great toss to lose. And this time, Drama was right. Brilliant effort, lads.